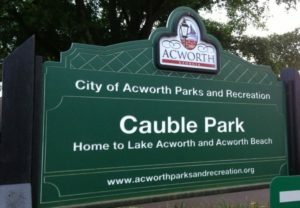 Acworth Beach and Cauble Park are located together at 2293 Beach Street in Acworth, on the north side of Lake Acworth, at the most southeastern part of Lake Allatoona. The park opens daily at 7 AM for joggers, walkers and fisherpeople, among others. You are welcome to spend a few quiet moments alone by the lake before the day gets too crazy. You are also welcome to cook burgers and ribs for a few hundred of your closest friends later on. You’ll find four picnic pavilions to choose from, the gorgeous gazebo and the beach house on the 25-acre property. There’s no better place for a summer concert before the park closes at 11 PM. Acworth Beach is open from dawn until dusk from early May through the Labor Day weekend. Lifeguards are not on duty, so swim at your own risk and keep watch over your own flock of kids. Pets, alcoholic beverages, PA systems and additional grills are not allowed. Monday through Friday, parking is free to the public. On weekends, only City of Acworth residents get free parking. The rest of us must pay $10 cash per vehicle between 8:30 AM and 6:00 PM.